A Docklet I have been working on for the last month or so, It would let you monitor multiple emails accounts and display the total number of mails available at their inboxes. It supports POP3, IMAP4 & Gmail via HTTPS protocols and has several configuration options. It would let you automatically or manually launch an email application either globally or on a per account basis. It may play a wave file whenever mails are available at either account or on a per account basis. The docklet supports either plain or SSL/TLS based connections to the mail server. SSL support provided by OpenSSL library statically linked (so no additional download/setup is needed). The docklet supports configuration of Icons by letting you configure a complete icon set for background, new mail, animation played while checking for mails & context menu icons. The download includes icon sets contributed by schmrom & Ghostwalker for mac-style, yahoo & gmail icon sets and an Icon set by myself based on my logo. I appreciate you both for helping me out by contributing such great icon sets! The docklet includes portions of code from little boy's task list docklet. Thank you too for all your support. Although the docklets has been under heavy development for the last month, it might still be buggy, please give it a try and post your comments. It was tested on both XP & Windows Vista, I have received reports that it works too with RocketDock & RKLauncher (although some minor glitches still persist on those docks). 18/11/2008 - Fixed bugs with IMAP checking implementation & Gmail via HTTP, that yileded incorrect mail counts. 23/11/2008 - "Check Mail Now" via left-click & hold, integrated the two context menus in a single one, accounts will be checked upon mail application launch. yay! fedroponce you are amazing. finally a check mail docklet that works! atleast half-way... im using it to check gmail and imap. the gmail goes through, but the imap doesnt. I know the port is open because Thunderbird uses it to access the same account (not at the same time mind you) System: WinXP Pro SP3, ObjectDock Plus, 2GB RAM @ 1.66Gh & T7200. Please take a look at the aqua-soft forum, I published a small command line utility there that may be used to troubleshoot IMAP connections, please download it and post your findings... in the mean time, did you double-checked your ports/SSL assignments (some email providers do not use standard ports or provide SSL only access). The link was already included in the description of the docklet at the top of this page. Well, this is the standard procedure for docklets under OD (and I may say any other dock out there compatible with OD). That being said, I would double check the download (try re-downloading it) there should be a CheckMailDocklet.dll under the CheckMail folder, you should also check for folder permissions (specially under Windows Vista which is a bit picky on what gets saved under the Program Files folder). This is the best thing since sliced bread. It lacks one small thing though, I'd want it to check mail if I click on it when there's no mail. The docklet actually let you do that (there's an option to lauch the app even when there are no mails), but (why there's always a but) there is a consideration if you have only one account and there are no new mails (or all accounts configured render a cero count) then the count icon will not be shown... then there is no way to lauch the app). This was donde since some users requested (during initial development) not to show the notification icon when there are no mails... I would like to here from you if you want that to be changed). I think you misunderstood me. I don't want it to run my mail program (I knew about that feature already ). I want it to check my mail accounts to see if there's new mail. The reason for this is that I occasionally want to check my mail more often than every 10 minutes (which is my current setting), so it would be great if I could just click on the icon, rather than have to right click and select "check mail now". Well... I'm not sure... it's almost a general understanding that clicking on a docklet will launch something. What I may investingate is to CTRL + Click (or some other key+click combo) could trigger the update. Edit: I have updated the docklet (latest release at aqua-soft thread - will update shortly here if no more changes are made and no bug reports are fired). The new release (v.0.1.0.9b) will now let you do a Check Mail Now by Left-Click + Hold for a couple of seconds, the docklet will check mails again as soon as the app is launched manually & finally the account context menu was integrated to the regular context menu. Thank you for yor feedback... right now I am collecting suggestions to incorporate in the next release. I have taken note. The click-hold feature is great! Just one thing, could you make an option to configure the delay in 10ths of a second precision or something? I find the current setting way too long. Come to think of it... 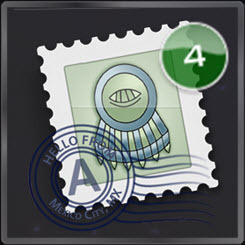 Setting a 0 delay could disable running a mail client, and just check mailboxes on click. Then I'd get the original functionality I wanted, and everyone is happy? Other than that, there's really nothing wrong at all with this docklet. I'm a happy camper! I'm afraid it is not an easy task... since the click'n hold functionallity is a ObjectDock SDK function... it would require me to completely ignore the SDK way of doing. I think I will explore that when I update the docklet. Anyway, thanks for your feedback. hello, for some reason the check mail doesnt launch the browser anymore-- i had it linked to both firefox and chrome (parameters: http://www.gmail.com). it worked for a while but then it just stopped working. i had the box "run program even when there are no mails" checked normally, but unchecked it still doesnt work. help!!! i love this docklet!!! A couple of things to note: - Is the "Limit program to one instance" option enabled? If so, does disabling it yields a better result? - Configure a default program and the modify one account to use the default program (Enable "use default application") don't worry yor customized option will not be lost it will simply be ignored. Configure some simple application like calc.exe or notepad.exe just to discard any permissions problems. Hope this yields some light.